Atopic dermatitis (dog atopy) refers to a skin condition that occurs in reaciton to a substance that should not cause an allergic reaciton, such as trees or grass. The allergic reaction occurs when skin mast cells react to the allergen. This results in skin irritation caused by a release of histamine and other chemicals. Seasonally, allergies in dogs are frequently seen at the end of summer to early fall. Some dog breeds have a higher predisposition to canine atopy than others. See this chart on dog breeds and skin conditions. An estimated 3% to 15% of dogs suffer from a skin allergy. Symptoms start to appear as early as 1 month and as late as 3 years old. Bull Terrier with Atopy on Face (atopic dermatitis). Frequent causes of dog atopy and related skin redness include pollen, mold and mites. 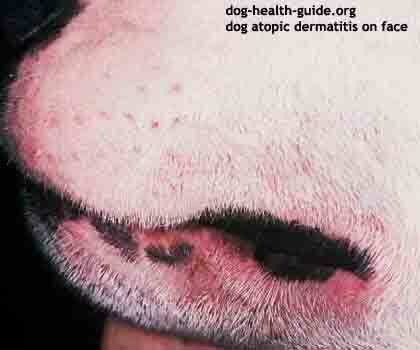 Canine atopic dermatitis usually starts on the legs, muzzle, groin, ears and abdomen. 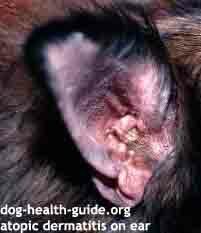 Allergic skin reaction (atopy) causing redness on dog ear. Scratching and itching can introduce infection causing bacteria into the skin. A veterinarian will take a patients history and examine any clinical symptoms. Allergies due to dog atopy will need to be differentiated from other causes of allergy such as flea bite dermatitis and food allergy. The preferred testing method is skin allergy testing where allergens are injected into the skin.If a reaction occurs, then the patient is diagnosed as having an allergy. This is the same procedure used in human medicine. It is possible that a dog has a false positive or negative reaction, where skin reacts when the dog is not allergic. Other avaialble dog skin tests include a biopsy, where a skin sample is examined under a microscope. A veterinarian may also opt to observe changes in the dog skin condition over time if conditions such as bacterial folliculitis (bacterial skin infection at the base of the hair follicles) is suspected. Treatment involves identifying and if you can, removing exposure to the allergen. Other options inclue immunotherapy hyposensitization, otherwise know in humans as receiving allergy shots. In this approach a dog is exposed to small doses of the allergen. This will build up the dogs tolerance to the allergan over time. Immunotherapy is successful in 60% to 80% of dogs treated. This approach might also be preferred to the use of steriods, which can have side effects. Dogs will be monitored every 2 to 8 weeks after the start of treatment. Once the allergy is under control visits to the veterinarian can occur with less frequency. Shampoo Therapy: An anti-itch shampoo such as Allermyl used in cool water can benefit a dog suffering from itchy skin. Antihistamines: This approach is not as effective as using a steroid. Side effects include drowsiness, lack of appetite, diarrhea and vomiting. Cyclosporine: This medication will start to work in 1 to 4 weeks and can provide long term relief. It is used as an alternative to corticosteroids. 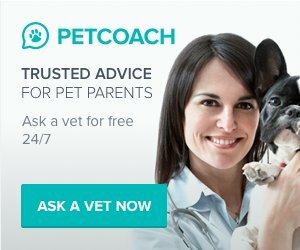 Corticosteroids (prednisolone): Steriods are used over short periods of time to control dog skin itch. Steroids are used at the lowest dose possible due to side effects such as hyperglucocorticism (Cushing's Disease). Tiamcinolone Spray: Products that contain .015% triamcinolone such as Genesis Virbac can help to control dog body itch. Skin condition might be improved by enriching the diet with a fatty acid supplement such as Omega-3 and/or a natural remedy such as Skin Care & Coat Tonic. (1)Kwochka, KW: Food-Related Dermatoses in Dogs and Cats. 22nd Annual George H. Muller Veterinary Dermatology Seminar in Hawaii, 2006.